The Mite White had a couple tough games on Sunday at the CSC against TRF. We played a very aggressive first game but came up short 12-5. We were pleased with how hard we went after the puck carrier and attacked the loose pucks. Our second game we had a bit more offense with 9 goals but we still lost by a pretty good margin. Again, we played hard and attacked when the times presented themselves. Goal scorers for this weekend were Rowan Benoit, Jacob Biermaier, Lukas Helgeson, Kai Hoppe, Bladen Melsa and Asher Vigness. Colin Trudeau was out goalie again this week and had a few outstanding glove saves to help keep the games bearable. Thanks, Colin for the hard work in net. Player of the week for the White is Asher Vigness. Asher got a couple goals in the second game which was the tougher of the two. He really played hard and took a couple of hard shots that found the back of the net. As a coaching staff we think that he did a very good job on offense and still managed his strong defensive game like he has the last few weeks. Keep up the good work Asher! Mite Blue played at home this past weekend with a doubleheader against Thief River Falls Blue and White. Brayden Wahl was in net this last week. For only a few practices, Brayden played excellent in the net. The First team we played was TRF Blue and what a great hockey game to watch, it was a high energy, and high scoring game. Although we lost 23-17 our team felt as if it was a win, and kids had fun! Scoring in this game was Kegan Erickson (2), Davin Janek, Blair Johnson(2), Keegan Lessard (4), Braxton Miller (2), Caden Perry (6). The second game We played TRF White. We quickly ran out of energy in this game and took a 16-2 loss with Blair Johnson and Braxton Miller finding the back of the net. We are looking forward to the Crookston Jamboree this coming weekend. This weeks player of the week is Keegan Lessard. Keegan has really improved this year and it is a result of his dedication and hard work. Congratulations Keegan! The 8U team had this past weekend off. This upcoming weekend the girls will be playing in their home Mite/8U Jamboree. They will be busy with all 4 of their games on Saturday. The girls have been working hard at practice all week and they are ready to play. The team is very excited to be hosting this weekend’s Jamboree. Player of the Week: Shyuh Burnette. Shyuh has been working hard and improving her skills this season. She has a great attitude and always has a smile on her face. Shyuh listens to the coach’s advice and strives to be a better player. Her infectious personality has been a joy to be around for coaches and teammates. She is a very versatile player whether it be forward, defense or goalie, she does it all and is not afraid of a challenge. This coming weekend Shyuh will be in net and ready to take on whatever comes her way. Congratulations Shyuh and keep working hard! Crookston Squirt A started the weekend with a tough loss in Grand Forks against the talented Titans (0-9). Saturday they traveled to Bemidji where they played a great game, just falling short at the end (3-4). Sunday the Titans came to Crookston for a rematch. Squirt As were ready this time, working together and fighting hard to the end. They took a loss in the end but played an amazing game (6-8). Our player of the week is Grant Funk. Keep up the great work, Grant! Squirt B’s had a tough weekend with 4 games, playing 2 Bemidji teams and 2 Thief River Falls teams. Bemidji 12-0. Bemidji 9-1 with Hudson Rick scoring assisted by Wyatt Marsyla. TRF 10-0. TRF 13-1 with Camren Duncan scoring assisted by Wyatt Marsyla. Player of the week is Jace Bruggeman- he had a good weekend, he blocked many shots and did amazing in front of the net. Jace has had a good year and is a good kid on and off the ice. He’s always helping out where and when he can. Keep up the hard work, Jace! The 10u girls had one game this previous weekend, on Saturday, against Moorhead Black. With two girls missing, the team had to work extra hard. Mya Bower made her debut in the net, stepping up to play goalie for the first time ever. Emma LaPlante started Crookston off by scoring two goals in the first period. Logan Brekken got the third goal from a great pass by Alexa Bartrum. Emma LaPlante got Crookston’s fourth goal for the hat trick, and the score was 4 to 1 going into the third period. Moorhead scored three goals in the third period tying the game up. Crookston worked hard but couldn’t hang on, losing in overtime with a final score of 5-4. The girls don’t have any games this upcoming coming weekend, with their next game being February 22nd in Thief River Falls. Player of the week: Mya Bower. Mya stepped up and played goalie for the 10u team this past weekend. With the crazy weather last week, she was only able to get two practices in with the pads on. She did a great job and made her teammates proud. Mya is a dedicated player who never misses practice or games, except for extreme circumstances like her uncle’s wedding! Work hard in practice, keep a good attitude, and your efforts will be rewarded in games! Keep up the good work May! Congratulations to Connor Maruska and Kadin Edwards on being named Peewee A players of the week. Connor and Kadin both played their best hockey this past weekend. Connor scored a couple of beautiful goals Friday night. Kadin has been working hard on moving the puck up the ice for an offensive zone attack. Keep it up boys! 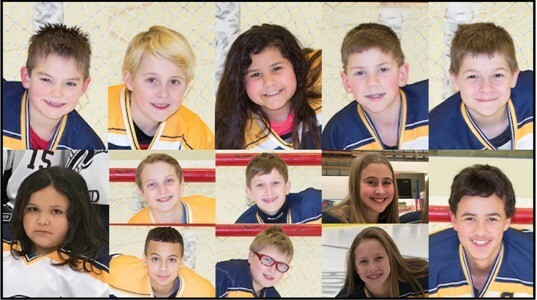 This weekend the Peewee A team lost 4-3 in overtime against Red Lake Falls Friday night, lost 5-0 to Thief River Falls on Saturday afternoon and lost 3-0 to Detroit Lakes Sunday morning. The PeeWees had a tough weekend, we had a rough road trip to Bagley and then on to Bemidji on Saturday. Bagley only has 1 PeeWee team and they were very good and they jumped out on us very quickly and never looked back, they are the number 2 team in the district. After that we headed to Bemidji to take on the number 1 team in the district, obviously, they are a very good hockey team as well. We played hard but came out on the wrong side of a lopsided score. We played hard both games and we tried to take a few positives from those game moving forward. On Sunday we played TRF at home and again had a rough start, there were times when I felt the kids played some of there best hockey this year. They played aggressively and we were trying to pressure the puck but Sunday just wasn’t our day and we lost another lopsided one. Players of the Week: Michael Bochow and Jack Buhler both for similar reasons. Both kids got asked to play positions this weekend that they are not used to and both stepped up and did what needed to be done for the team. Both kids showed everyone that they are team-first players and great all around teammates. I am proud of both of them because it is not easy to be thrown into new positions but both did it with smiles on their faces and to the best of their abilities. Thanks Jack and Michael! The 12U girls participated in the Moorhead 12UA Tournament this past weekend, winning two and losing two. On Friday, Crookston played a tough Rosemount team and lost 5-1. Scoring Crookston’s lone goal was Addie Fee, assisted by Reese Swanson and Brekken Tull. Karl Arthur was in net and recorded 18 saves. Saturday morning, the 12U defeated St Cloud 9-3. The 12U dominated the entire game from beginning to end having 46 shots on goal. Scoring for Crookston – Brekken Tull(2), Kaylie Clauson(2), Georgia Sanders, Coral Brekken, Addie Fee, Morgan Nelson & Reese Swanson. Assisting for Crookston – Morgan Nelson(2), Maddie Harbott, Ashlyn Bailey, Addie Fee, Brekken Tull & Reese Swanson. Kyrie Schehr was in net and recorded 16 saves. Saturday evening, Crookston took on the Fargo Freeze. The girls played a very aggressive, competitive game and held the Freeze off the first two periods. In the third period, the Freeze capitalized on a power play to put the first goal in the net. Crookston lost 2-0, which put them at third place in their pool. Karl Arthur and Kyrie Schehr split the net, saving 27 shots combined. Sunday morning, Crookston beat Forest Lake 6-5 in a physical, competitive game. Crookston started off slow, allowing three goals past the goalie in the first period. Crookston regrouped in between periods and the score was tied 4-4 after the second period. Crookston capitalized on a power play at the beginning of the third the finally take the lead. Two minutes later, Crookston put another one in the net to seal the win. Scoring for Crookston – Reese Swanson(3), Cassie Solheim, Addie Fee & Coral Brekken. Assisting for Crookston – Addie Fee, Coral Brekken, Brekken Tull, Cassie Solheim & Reese Swanson. Kyrie Schehr and Karlie Arthur split the net, saving 12 shots combined. The Crookston 12U ended their regular season 23-13-0 and will head to East Grand Forks this weekend for The 12UA District 16 Tournament. Player of the Week – Georgia Sanders and Ashlyn Bailey. Georgia is a consummate team player who has a great understanding of the game. She has been working hard in games and practices all season long. With her hard work and tremendous hockey sense, she is reaping the rewards and hammered in a big goal last weekend. Georgia is extremely coachable and is a big asset to the team. Ashlyn is a 1st year 12u who plays defense for us. Ashlyn works hard and plays physical, she helped us take home the consultation championship in last weekend’s Moorhead tournament with her strong defensive play. She is also a great teammate to the rest of the girls. Keep working hard ladies!! The Crookston Bantams wrapped up their regular season this past weekend with trips to Baudette and Roseau. On Friday night, Crookston defeated Baudette. Alex Longoria had the hat trick (3) and Nathan Kelly added another in the third for the 4-1 win. Assists went to Longoria and Blaine Andringa. Jaren Bailey had 30 saves. On Saturday, Crookston defeated Roseau. Alex Longoria had his second hat trick (3) of the weekend and Zac Tahran added a pair of goals to lead Crookston to a 5-3 victory. Assists went to Blaine Andringa(3), Alex Longoria (2), and Jackson Demarais. Jaren Bailey had 38 saves. 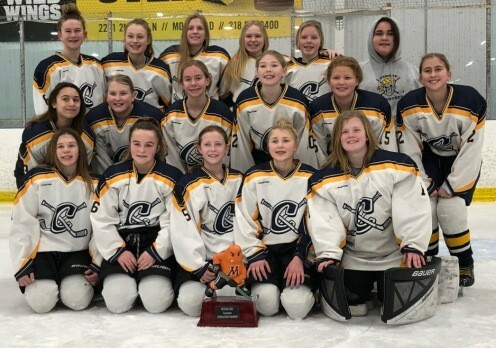 Crookston ends its regular season at 21-12-1 and will head to Bemidji this weekend for The Bantam B District 16 tournament. Player of the Week. Alex Longoria. Alex Longoria had another great weekend of hockey with 6 goals and 3 assists. Alex is one of the leaders on our team and pushes the rest of the players to be their best week in and week out.